SAUDI Aramco has built its reputation on providing energy to the world, but through its Domestic Sales and Logistics Department (DS&LD), the company provides energy in Saudi Arabia, selling refined petroleum products and liquefied and natural gas to local customers and beneficiaries, building good and strong relations and meeting local demand safely. It takes a well-organised administrative structure to meet the kingdom’s growing demand for energy and one able to meet the differing needs for fuel among customers as varied as gas stations, power plants, water desalination plants, farms, factories, bakeries, ships, construction and road asphalting companies, haulers, airports, and government organizations, says Abdulmohsen Saad Al Rabeeah, manager of DS&LD. Given this, DS&LD has divided its workload into three main divisions – Domestic Sales Division and Hauling and Logistics Division and Gas/NGL Planning and Domestic Marketing Division. The Domestic Sales Division manages three units distributed over the Eastern, Central and Western regions. It also manages sales offices at all Saudi Aramco’s bulk plants. Through these three units, Saudi Aramco supplies more than 2,700 customers with refined petroleum products, liquefied and natural gas, bunker fuel, aviation fuel and sulphur. Saudi Aramco loads more than 7,200 tanker trucks per day, and consumption of petroleum products is estimated at 2.02 million barrels per day (mbpd). Helping to ensure the best service and support to its customers, DS&LD launched a special customer care centre working around the clock, according to the highest international standards. The Hauling and Logistics Operations Division – which schedules tanker trucks along the network of highways to bulk plants around the kingdom – is also divided into the three main regions. It includes a special Hauling Contracts Procurement and Comp Unit responsible for concluding contracts with local hauling contractors to ensure the availability of needed tankers. Besides its main task of serving as a technical consultancy centre to the Ministry of Petroleum and Mineral Resources in responding to inquiries in the field of gas and natural gas liquids, the Gas/NGL Planning and Domestic Marketing Division also performs a major task that goes beyond the boundaries of both the department and the company, driving industrial development in all regions of the kingdom through the assessment of new producing projects that add value and contribute to the establishment of manufacturing industries. Making sure Saudi Aramco is able to reliably meet this demand requires careful forecasting, a key task of the Demand Forecast and Market Intelligence Group. 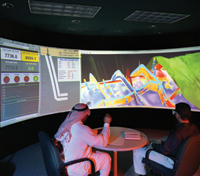 Through its Allocation Unit, this group allocates based on specific instructions issued by other government agencies, including the type of business and its impact on the kingdom’s economy, the business’s energy efficiency, the business’s added value to the Saudi economy and Saudisation. The group’s Demand Forecast Unit then prepares short-term forecasts (one year monthly forecasts) and long-term forecasts (five- and 10-year forecasts) of domestic demand for petroleum products in all sectors of the economy and by regions of the kingdom. Helping all divisions of the department perform their tasks, the Planning, Training and Support Group writes the weekly, monthly and yearly reports issued by the department and coordinates and integrates the activities within the department. The group also receives engineers and employees who are newly graduated.